Introducing our autonomous race car partnership with NASCAR. build the next generation of racing technology. Humans cause the vast majority of all auto accidents and experience 100% of all traffic annoyance. The answer, obviously, was self-driving cars. The question, obviously, was how on Earth to build them. Helping to put much of the paved world into a searchable and surfable 3D-image database apparently was insufficiently ambitious for Street View engineer and former Stanford professor Sebastian Thrun, who went on to found Google's autonomous vehicle program in 2008. Our early test project, code-named Caddy, demonstrated that self-driving golf carts could drop people off at designated locations and pick them up at designated times, all without wasting fuel, taking up parking space, or playing music you don't like but are too embarrassed to ask the cabbie to turn off. Google's automated cars have driven more than 200,000 miles without a machine-caused accident. And yes, this image really is what the vehicle "sees" when it's driving. Nevada has established a testing framework to allow these cars to be operated for real, with California filing legislation to follow suit. Self-driving cars in Vegas and Hollywood? The launch of our NASCAR partnership sets the autonomous vehicle team onto yet another uncharted road. At least this time they'll have a sweet ride. we think automated vehicles will take us. The battery keeps the dish warm. The GPS plots the quickest possible journey. And the car, of course, drives itself. Your only problem will be choosing from which restaurant to order delivery. Where's she going after the party? Only her dashboard knows for sure. the same in the backs of theirs. via Bluetooth. All from the driver's seat. Future installations like this one may help our descendants understand how early 21st-century humanity still lived. Want to scope out the future of Google Racing? Get ready to meet our fleet. Google is working closely with the sanctioning body and has formed a racing division, Google Racing. Watch exclusive footage of Google's testing efforts and reaction from some of the top drivers on NASCAR.COM. Is the future of the sport in autonomous car technology? Surprise! As you might have guessed, Google Racing is an April Fools joke brought to you by Google and NASCAR. 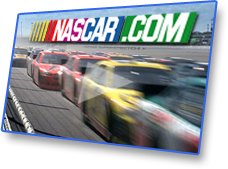 And while we won't be providing self-driving cars to compete in the races, we look forward to working with NASCAR on future projects. GOOGLE and the GOOGLE logo are trademarks of Google Inc. Third party logos are owned by their respective owners. Used with permission.